Of course drummer Max Roach was one of the all time jazz greats probably best known for his 50s band with trumpeter Clifford Brown. The 1960 album We Insist! is one of his most important albums as it is a social commentary about civil rights. And it features his soon to be wife Abbey Lincoln on vocals. In 1959, Roach and Oscar Brown Jr. began working on music they planned to perform in 1963 at the 100th anniversary of the Emancipation Proclamation. But they decided the urgency of the civil rights movement was too important to wait. So they wrote Freedom Now Suite and it was released in 1960 on Candid Records. Brown lived in Chicago and Roach lived in New York. Brown says they wrote it over the phone. After most of this was written, Brown backed out as he disagreed with Roach over the ending. Brown thought there was too much unnecessary screaming. So he wasn't involved in the recording. The album was produced by Candid A&R director and legendary jazz critic Nat Hentoff. Of course the key figure on the album is singer Abbey Lincoln who married Roach in 1962. Driva'Man is the first track on the album. It is supposed to evoke images of slavery. Musicians are Booker Little on trumpet, Julian Priester on trombone, Walter Benton on tenor sax and James Schenk on bass. the sax solo is a guest appearance by the legendary Coleman Hawkins. At the time, Roach was criticized for addressing such a controversial subject. You have to remember he was one of the first jazz musicians to do that. He even tried to turn We Insist! into a play. Today We Insist! is acclaimed as a landmark of jazz and the civil rights movement. It's available as a budget CD and it was released in Europe with three bonus tracks. 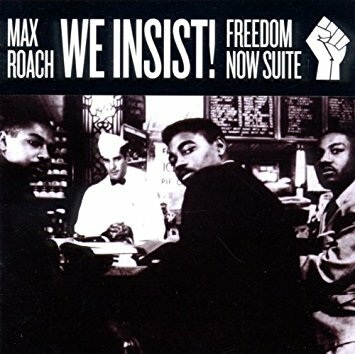 Two of the songs are from the 1960 Jazz Artists Guild album Newport Rebels and the other is from the album The Jazz Life also by The Jazz Artists Guild. I guess it makes the CD a better value but they aren't related to the rest of the album. This album is a must for jazz fans. Here's Max Roach with Abbey Lincoln, Clifford Jordan on tenor sax, Coleridge Perkinson on piano and Eddie Kahn on bass performing Driva'Man on Belgian TV 1964.